I've written a tool to help OS X users edit their Retrode's config and install firmware updates without the terminal. The software is open source and can be found at GitHub https://github.com/cyco/Retrode-Utility. I've also set up a little project page where you can download the application http://cyco.github.com/Retrode-Utility/. @Matthias_H: As you can see I took the liberty of using an image from retrode.com, if that's not ok i will be happy to remove it any time. Wonderful! Looks great; I'll give it a try whenever I manage to. The image, of course, is all yours for such a noble cause! EDIT: How about .srm files? It might be rather useful to be able to drag-and-drop such files onto the GUI (or allow for any other way of copying a file) because they won't be copied properly through the Finder. What's the "safe mode"? Some balloon hints might be useful here and there. I no longer sell the Retrode. For sales inquiries, please contact our friends at DragonBox. Excellent, and way better than my approach of a command line app. 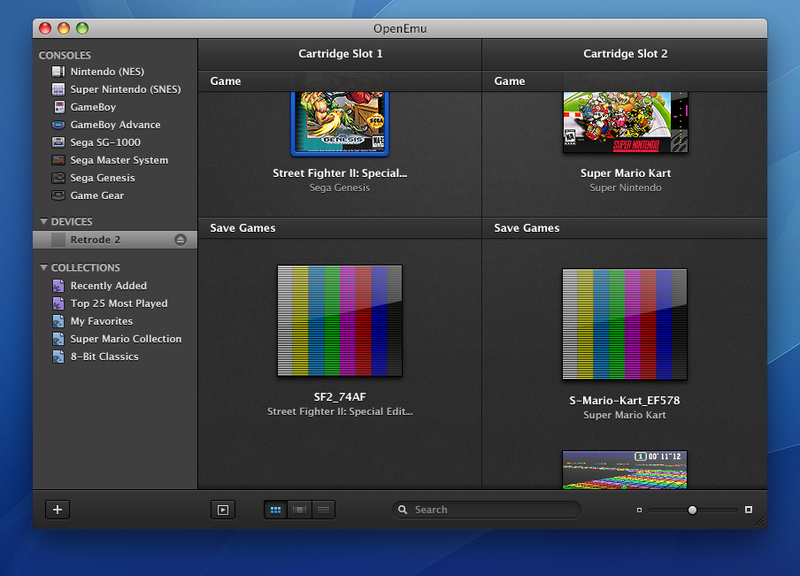 Also, I'm really interested to see the next version of OpenEmu. Looking good. Whoops, safe mode slipped into 0.2 by accident and doesn't do anything. The mode was supposed to keep the retrode from mounting so access to the files would only work though the utility. That would allow users to reset the device without getting the annoying "The disk was not ejected properly" dialogue. However, i couldn't figure out how to do it without root privileges which didn't seem feasible. That's why i dropped the idea. I like the idea of beeing able to drag srm files onto the window. Is there any way to make this work with the original Retrode? I tried connecting it but doesn't work at all even though I can see the USB mount. @agaiz: To make this work with the original Retrode i need some more information on it. Connect your Retrode, open System Information.app (formerly known as System Profiler, found in /Applications/Utilities/), then select USB from the Hardware section on the left and locate your Retrode in the upper view. Now copy the text form the lower view and post it here or via pm. 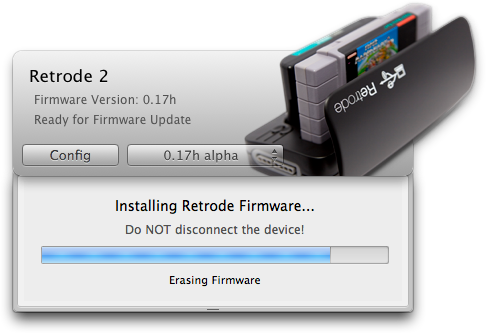 Also, just to make sure I have enough info to work on, put the Retrode into DFU mode and do the same thing again. Note that this time the Retrode will probably show up as "Application Specific Device". So essentially only product ID and location ID differ from yours as far as I can see. Awesome, now it shows up. Need a matted PNG of the Retrode 1? I'll see if I can find one. Do you need any information on the R1 config file to enable editing it through your tool? Probably not. 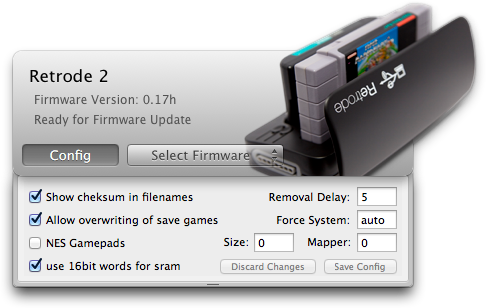 It depends on the firmware version more than on the model revision. @cyco, here's a (poorly) alpha-matted photo of the Retrode 1 for use in your utility (follow hyperlink on image). Please let me know if you need other/more material. Presumably XCode 4.3.2 doesn't support the syntax used here to create an inline NSDictionary? Time for an update I think! Edit: Updated XCode, built successfully, but it does not detect my Retrode 2. /Volumes/RETRODE is definitely showing up. Back to the drawing board? Is there something in 10.8 that's required? Thanks for the hard work Cyco. Any way we can get this compiled for OSX 10.7x? My mac laptop can't be updated to 10.8x unfortunately. I see gadgetoid was working on something, any more luck?